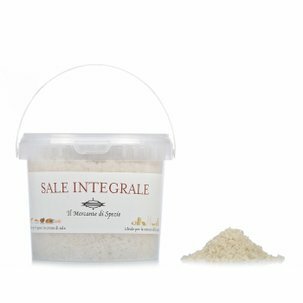 The Fleur de sel Orange and Lavender Salt from Il Mercante di Spezie is made with salt harvested by hand from the salt pans of Trapani where the winds favour a slow crystallisation. The salt has an extremely elegant and pleasantly versatile aroma where the lavender jazzes up the orange citrus perfumes. Try it on your favourite dishes, on light vegetable recipes but also on crispy Sardinian carasau bread with a little mild and fruity olive oil - a simple and very elegant light snack. Ingredients Italian fleur de sel 97.7%, Lavender 1.3%, Orange peel 0.93%, Essential orange oil 0.07% For more information on product labels, please contact our Customer Service department. The information on the labels of the products may vary for reasons beyond our control, therefore, there may be discrepancies between the information on the site and that on the products delivered. Please always check the information on the product before consumption or use.